There are many ways of getting from Bangkok to Koh Mak using bus and minibus, including the 999 Bus, Suvarnabhumi Bupara Co Airport Bus and government services from Ekamai and Morchit Bus Stations. You can now also use the Boonsiri catamaran bus/boat service from Khao San Road. If using the public bus, the easiest way of getting from Bangkok to Laem Ngop (Krom Luang) Pier, the departure point for Koh Mak, is to take the 999 Express, which heads directly to the Koh Chang ferry piers at Centrepoint Pier and Ao Thammachat. Laem Ngop Pier is 10 minutes from Centerpoint, 20 minutes from Thammachat. The first bus leaves at 07.45am from the eastern bus station, Ekamai, via Suvarnabhumi Airport Bus Station (08.20am) and travels direct to Centrepoint Pier, arriving at 13.30. From Centerpoint, you take a songthaew share taxi at 50bt per person to Laem Ngop Pier. You should make the 14.00 Leelawadee Speedboat, though the 14.30 Seatales and the 15.00 Suansuk, are other options, all speedboats at 450bt per person . The 999 does run a second service leaving from Ekamai at 09.00am, calling at Suvarnabhumi Airport Bus Station at 09.35am. This heads to Thammachat Pier and then onto Centerpoint Pier arriving at 14.30 to 14.45. From Centerpoint, you take the songthaew taxi as above. You should make the 16.00 Panan but now have the new Suansuk service at 17.00 to fall back on. That said, we do advise you to get the earlier bus at 07.45am in case of cancellations or changes to the 09.00am schedule.. If the bus does not go on from Thammachat Pier to Centerpoint, you will need to charter a taxi direct to Laem Ngop Pier, 300bt minimum charge. The return bus service leaves from Centerpoint Pier at 14.30 and 16.30. For the 14.30 bus, take the 12.30pm Seatales or Suansuk from Koh Mak and again, hop in a taxi to run you back up to Centerpoint. You could also take the 13.30 Panan docking at 14.15, but this is cutting things very fine – it would be best to ring ahead to Relax Tour (number below) so that they can hold the bus in the event of any delays. For the 16.30, you can use either the 13.30 Panan off Koh Mak docking at 14.15 or the new 15.00 Suansuk, docking at 15.45 to make the connection. The 999 Bus does have an additional service, leaving from the Suvarnabhumi Airport Transportation Centre or Bus Station, which goes to Trat Bus Station instead. This service is once a day at 11.40am, 240bt. Boonsiri, the Koh Kood catamaran from Laem Sok Pier, does also call in at Koh Mak, docking at Ao Nid Pier. This means you can use their bus service at 05.00am or 07.30am from the Khao San Road area, price 800bt for the bus and boat ticket combined, kids 4 and under free, 5 and over adult price. The 05.00am bus links to the 10.45am boat from Laem Sok Pier. This goes via Koh Kood so arrives on Koh Mak at 12.50pm. The 07.30am bus links to the 14.20 boat, which goes direct to Koh Mak before Koh Kood, so arriving at Ao Nid Pier around 14.50. The return is the same price with the boat leaving Koh Mak at 11.00am from Ao Nid Pier to Koh Kood and then onto the mainland at Laem Sok. This connects to the 14.30 bus, which reaches the Khao San area around 20.30+. This return service can drop you at Lad Krabang, the Airport Rail Link Station (ARL), from where it is about 20 minutes to Suvarnabhumi BKK Airport, 3 to 4 trains an hour, 40bt per person. It does not go to the Airport direct. From 16/5/18 to 15/10/18, this service is suspended. We can organise this service for you. We reserve the seats, send you a voucher and you pay on the day. We also send a map of the office location. Please just contact us with your requirements. The next option is the public bus from Bangkok to Trat and from there, travel by songthaew taxi to the pier at Laem Ngop, just under 20 kilometres away. Realistically, you will only make the boat connections at 14.00, 14.30, 15.00, 16.00 and 17.00 if you take the early morning departures or the night bus. Otherwise, travel down slowly, the 12.30pm bus is a nice departure time, spend a night in Trat and leave the next morning with a taxi to the pier (50bt), but check the Koh Mak ferry and speedboat timetables first. From Khao San Road, there is a VIP bus service which departs at 8.00am and heads for Thammachat Pier for Koh Chang, arriving at 15.00 to 15.30, price 550bt per person. This would just allow you to make the 17.00 Suansuk speedboat connection at Laem Ngop Pier down the road. There are blue songthaews on hand at Thammachat Pier to run you down to the pier (minimum charge 300bt). The return, at 550bt per person, leaves from Thammachat Pier at 12.00pm, taking 5+ hours and calling at Rama 9 (Srinakarin) for the Suvarnabhumi Airport link, Hualamphong Railway Station and Khao San Road, arrival 17.30. Check with your resort on Koh Mak about transfer from Laem Ngop Pier to Thammachat Pier for this service. 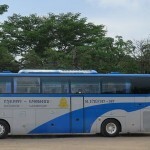 Suvarnabhumi Bupara Co (also known as Lonely Beach Express/Bus 392) has a direct connection from Suvarnabhumi Airport Terminal to Koh Chang at 07.50am (bus) and 09.30am (minibus or microbus), 11.00am (minibus or microbus) and 14.00 (minibus or microbus) from Gate 8, Level 1, priced at 600bt for delivery to your resort on Koh Chang. You could use the 2 early services and then ditch the last part of the ticket, instead taking a songthaew taxi from the Thammachat Pier to Laem Ngop Pier in time for the afternoon speedboats to Koh Mak. With the 07.50am bus, they do sometimes allow a fare reduction if you explain that you do not need the Koh Chang ferry and delivery. The 09.30am minibus may not always run if numbers are low. There is a cheap minibus service run by Triple T (TTT) to Trat leaving from Ekamai Bus Station, with the booth located in the middle of the row on the right hand side of the ticket hall. This runs every 2 hours, starting from 06.00am up until 18.00. It takes 5 hours and costs 270bt. You can use the services from 06.00am to 08.00am to make a Koh Mak connection, by getting out about 30km outside of Trat at the Saen Tung junction and changing to an orange open songthaew taxi (50bt) which delivers you to Ao Thammacht Pier, about 30 minutes travel time. From there, you can then get another taxi onto Laem Ngop (similar price but likely to apply a minimum charge). The 10.00am minibus is cutting it very fine. Alternatively, just stay on the minibus to Trat Bus Station and get a songthaew from there, 300bt for 2 pax to go immediately. With the later minibuses, you will need to spend a night in Trat. An hourly return service with Triple T (TTT) from Trat Bus Station starts at 04.00am. An identical Triple T (TTT) service runs from Morchit Bus Station to Trat Bus Station. The booth, number 16, is 3 lanes over out the back of the terminal in the main area from where the vehicles are all departing. Times are again very frequent at 05.00am, 6.00am, 9.30am, 12.00pm, 12.30pm, 13.30, 15.30 and 18.00. For Koh Mak, with the 05.00am, 06.00am and 09.30am, you can change as above at Saen Tung to a songthaew taxi for Ao Thammachat Pier and Laem Ngop Pier or continue to Trat Bus Station. Times back from Trat Bus Station are very similar but starting at 04.00am and ending at 18.00. The telephone numbers for these services are 084 148 1551 (Morchit), 090 818 1855 (Ekamai) and 090 818 1844 (Koh Chang at Ao Sapparot). From Laem Ngop Pier, you can pick up share minibuses to Ekamai and Morchit Bus Stations and Lad Krabang Airport Rail Link at 10.30am, 11.30am and 13.00, 400bt per person. For Suvarnabhumi Airport, hotels in the central Sukhumvit area and Phaya Thai BTS Station (Airport Rail Link), there is also a service at 10.30am and 11.30am, 550bt per person. The Sukhumvit hotel name is needed to check if it is in the drop-off zone. We can organise these 2 services for you. They do not include the boat tickets from Koh Mak, which are 450bt per person in all cases. There are daily minibuses from Pattaya direct to Thammachat Pier for Koh Chang, price around 450bt to 500bt. Once there, you use a songthaew taxi to get to Laem Ngop Pier, mininum charge of 300bt. From Ban Phe (Koh Samet), share minibuses are 400bt to Ao Thammachat, where, again, you can ask them to continue on to your pier for Koh Mak or get a songthaew. Return share minibuses direct from Laem Ngop Pier to Ban Phe (Koh Samet) and Pattaya are 400bt, 11.30am and 16.00 – we can book these returns for you in certain cases. 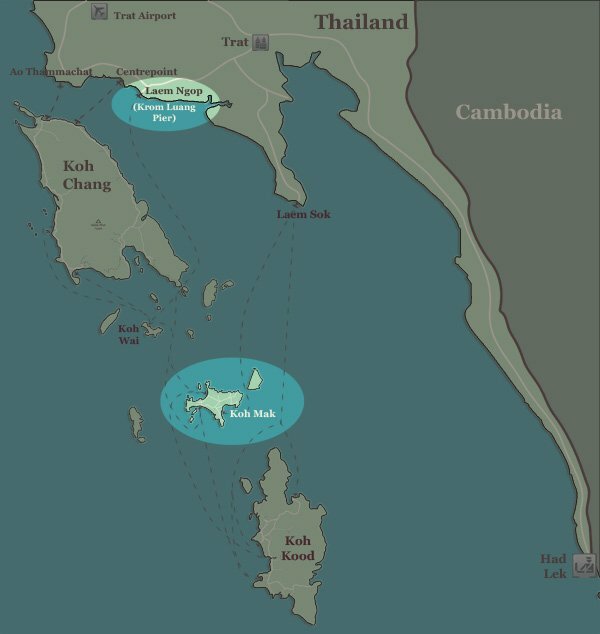 They do not include the boat tickets from Koh Mak, which are 450bt per person in all cases. Public buses do operate along this route, but are slow and probably best avoided unless Trat is your destination. You can Contact Us with your questions about Koh Mak. Please Contact Us to reserve boats tickets for Panan, Suansuk, Seatales and Leelawadee.